My mother taught me to notice and enjoy beauty. I think that is why I find so much enjoyment at the weaving loom. The interplay of colors and materials never ceases to amaze me. I am often delighted as I see the woven material forming under my shuttle, feeling more like an observer than a performer. 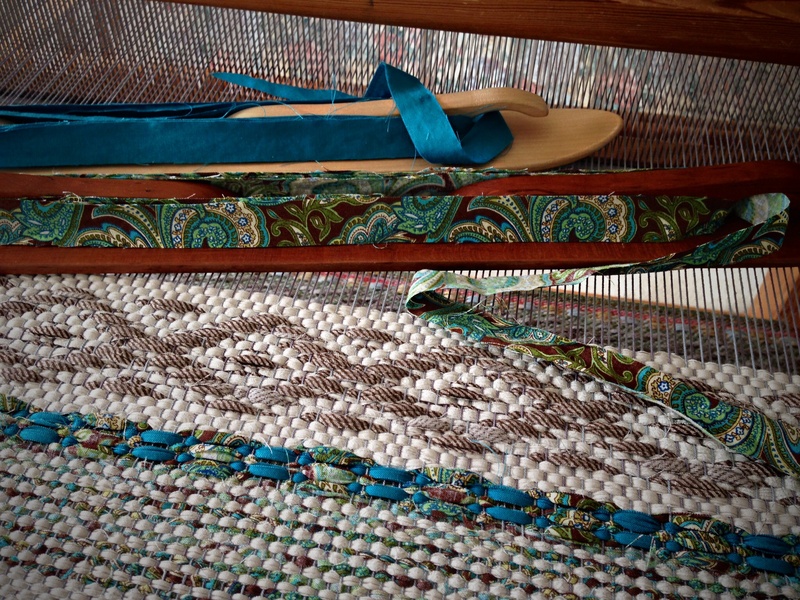 So, it was with great pleasure that I got to show my mom my weaving looms when she came to Texas for Melody’s wedding. 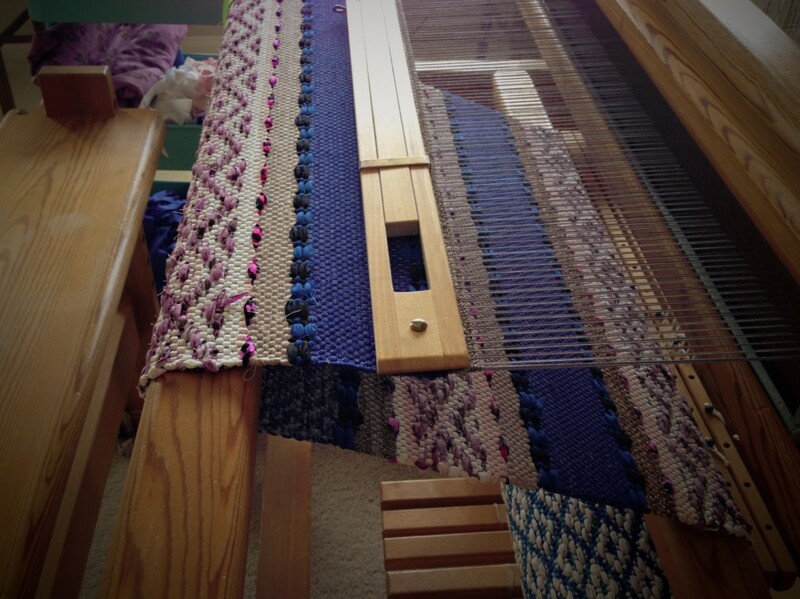 I put this rug warp on the loom with that special visit in mind. Thanks for everything, Mom! Seeing the underneath side of the rugs first, just after the rugs are cut from the loom. First step is winding the warp on the warping reel. 219 warp ends in two similar shades of grey, 8.5 yards / 7.75 meters long. 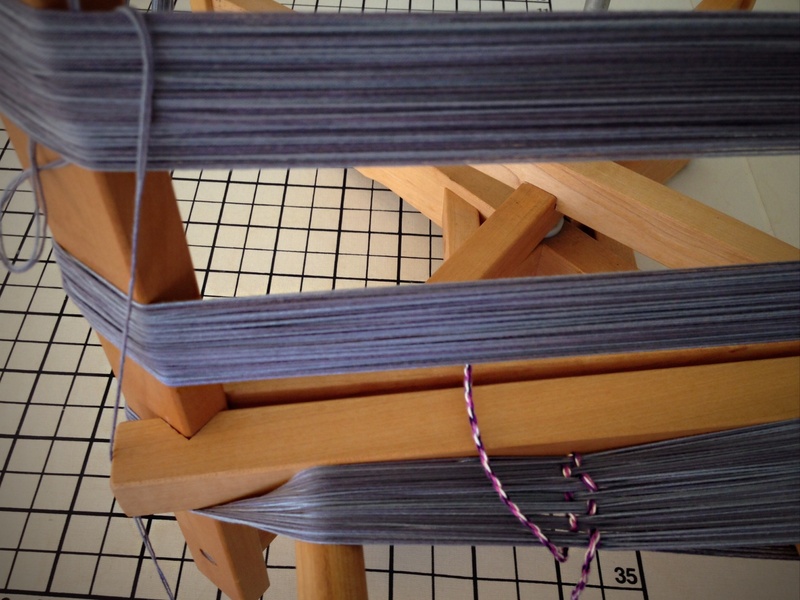 After weaving some waste fabric strips, I weave the hem, using 1/4 inch- / 1/2 cm- wide strips. 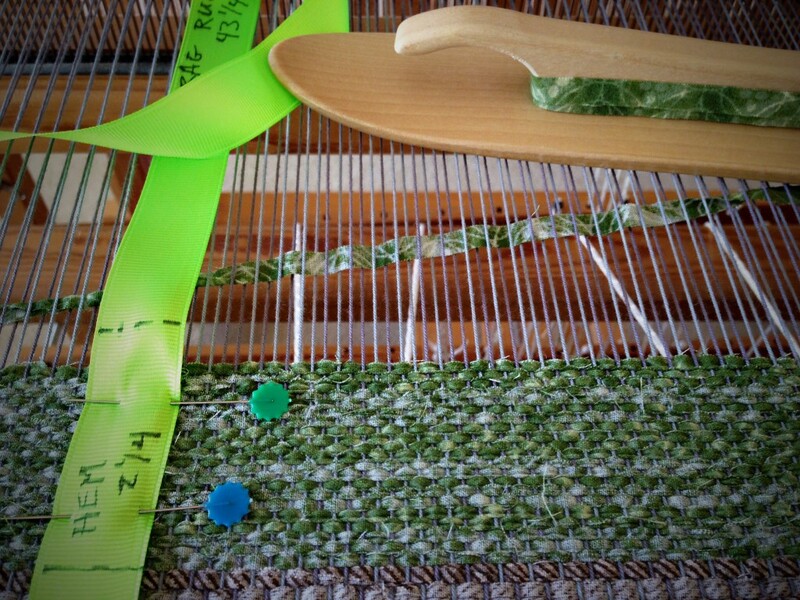 I mark the green ribbon to show the weaving length of the hem, and the overall length of the rug. I also mark the midway point on the ribbon. This is the rug my mother got to see on the loom. She liked it! Turquoise paisley fabric pairs with a solid blue to outline the brown rosepath design. Three ski shuttles create gradient color changes in the blue and teal (out of view) background, while maintaining the white rosepath pattern. It was a little insane to manage three ski shuttles! But I have to admit I enjoyed it. This is my version of Radiant Orchid, the Pantone Color of the Year 2014. Two-toned rosepath, with dotted outlines. Subtle turquoise waves almost hide in the dark earth tones at each end of the rug. Not yet cut apart, ready for finishing the ends and hemming. May you make fond memories with those you love. Thank you, Bev. I appreciate that! Karen, your work is beautiful. I am just starting to weave rag rugs, just a few questions ifyou don’t mind, how wide are your fabric strips in the rosepath rugs, and, do you prewash your fabrics? Thanks for the sweet compliment! – and the questions. I LOVE questions!! My fabric strips are 3/4″ / 2 cm wide, except for the hem, where I use narrower strips. I do prewash the fabrics. I buy 100% cotton fabric in 5 yard lengths. When you wash that long of a piece of fabric, it helps to serge to two ends of the fabric together, making a large “tube.” Then, the fabric won’t twist on itself in the washer and dryer so much. Let me know if come up on any more questions. I’d love to hear how it comes out! Karen, I do have another question, when you are doing the rugs above, you have just one 3/4 inch slice of fabric on the shuttle at a time, run it all the way across and then insert the next or send the same one back depending on the pattern draft. Correct? Am I understanding that it is the treading that causes the pattern? and makes one pick prominent over another? and you might use 6 or 7 fabrics in a pattern? Yes, each shuttle has a length of 3/4″ fabric strip wrapped on it. Each shuttle goes all the way across. The pattern determines which fabric color comes next, whether it is the same color, or a different one (on a different shuttle). I have used as few as three or four, and as many as a dozen different fabrics in a pattern. I LOVE playing with fabric and blending colors and patterns to come up with interesting combinations. May God bless your day, too! Are you weaving plain picks between the pattern? With a rag, or a smaller gauge yarn? 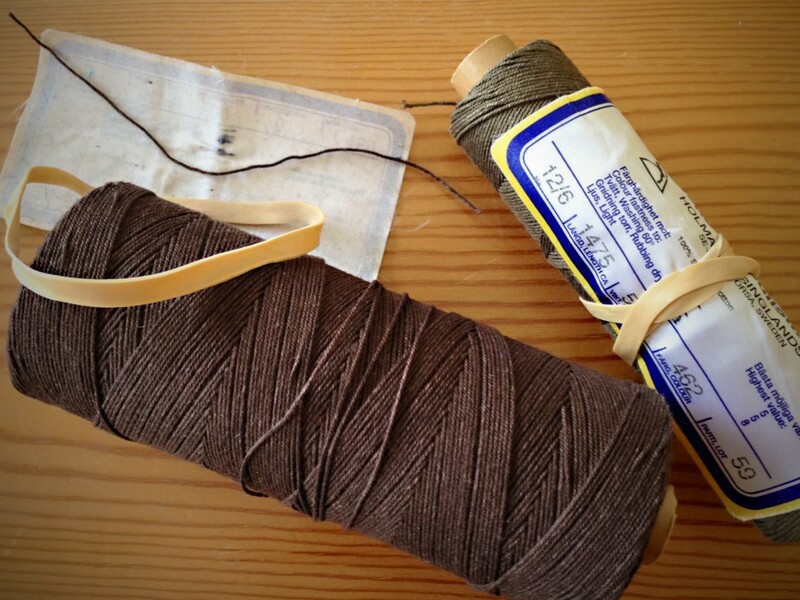 Are you using a traditional Swedish threading? 4 3 2 1 2 1? Hi Suzy, I appreciate your very kind compliment! Rugs like this are immensely fun to weave. Yes, I weave plain weave picks between the pattern. 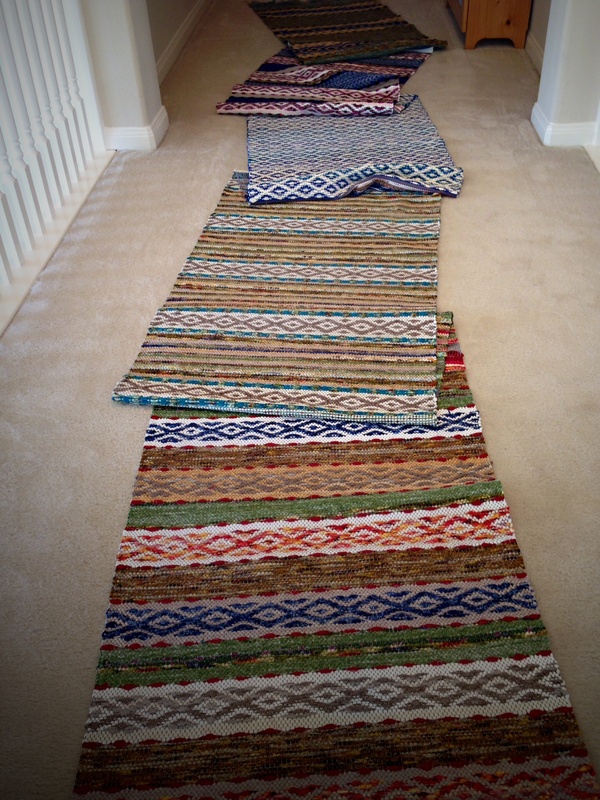 All of the picks in these rugs are with rag – 3/4″ fabric strips. 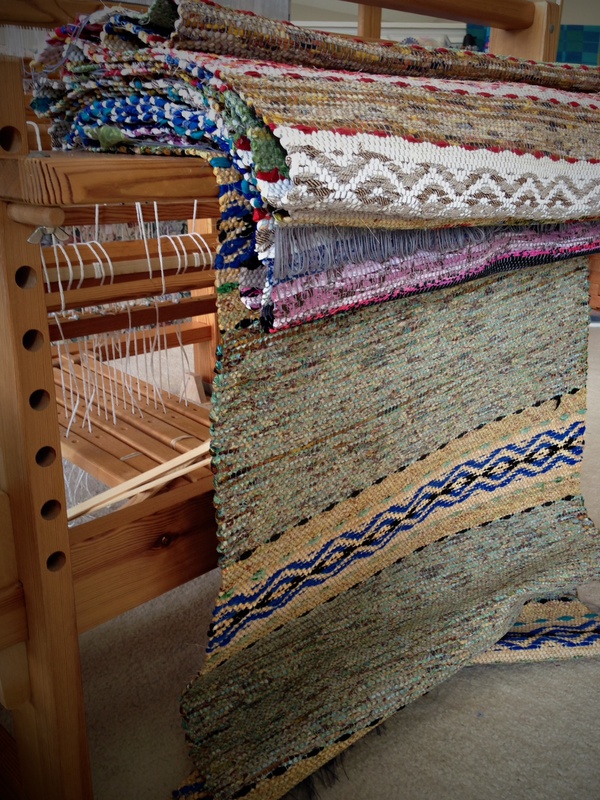 You can find the drafts for these rugs in “Favorite Rag Rugs 45 Inspiring Weave Designs,” by Tina Ignell. Sometimes you can find it from a second hand book seller. You are very talented, God has blessed you with an amazing gift. That is the kindest thing you could say! I just found your pins and all I can say is profound creativity. I just bought an 8 harness LeClerc, Jack loom and was wondering what type loom are you weaving your rugs on. For 15 years I have woven rugs on a 2 harness rug loom and am excited to move to the next adventure. I appreciate your kind words! 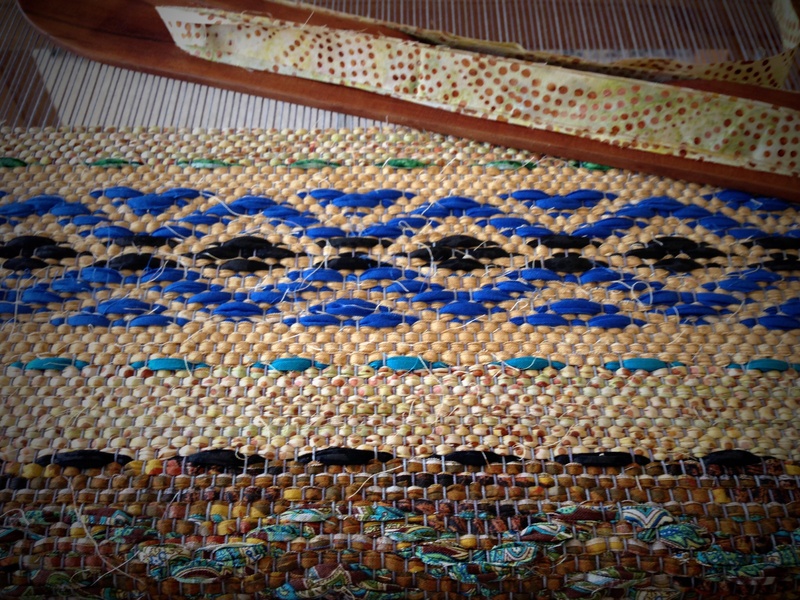 Creative expression is one of the best things about weaving. 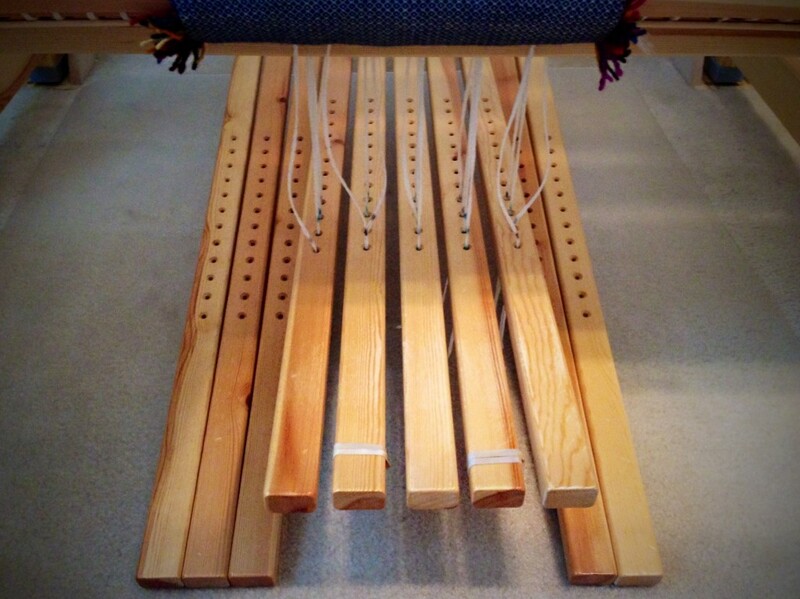 I weave on two Glimåkra countermarch looms–one Standard (120cm) and one Ideal (100cm). Enjoy all your new possibilities with 8 shafts! Just getting in to weaving eventually would like to get to your level. What loom shall I start with and can I teach myself? 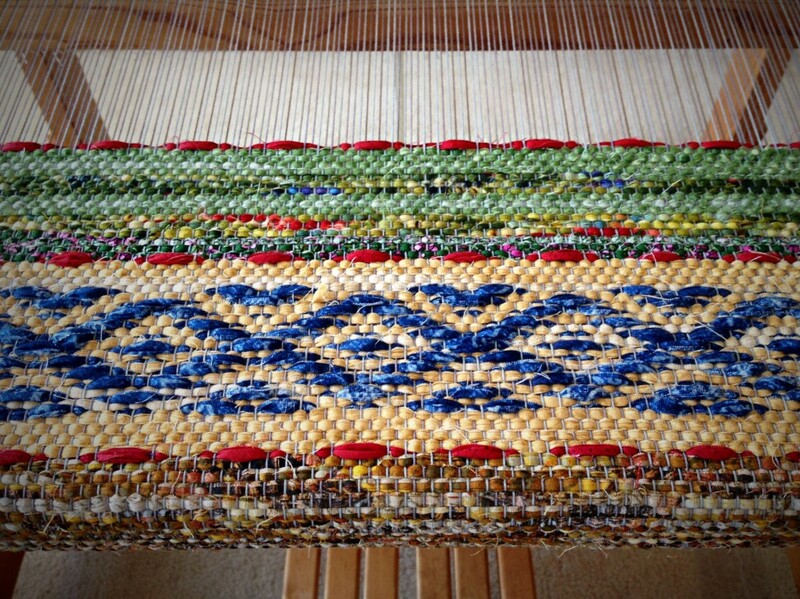 Hi Lynne, Welcome to the world of weaving! I started weaving with a 120cm (47″) Glimakra Standard countermarch loom. It was a great loom to begin on. 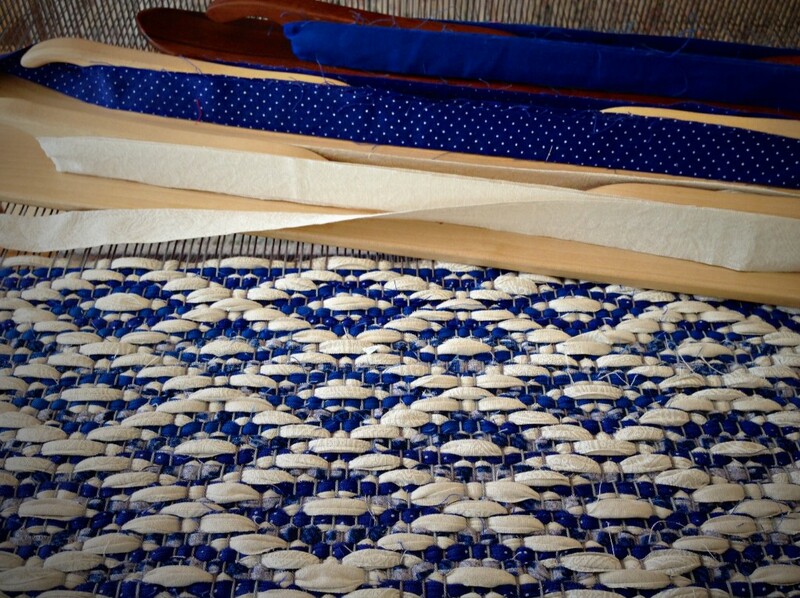 The range of fabric types it can weave – from fine lace weaves to sturdy rag rugs – made it possible for me to try many new things without being limited by the loom. And the generous size of the loom makes it easier to dress than a smaller loom. The countermarch action, the back-hinged treadles, and the hanging beater all give advantages to the weaver. 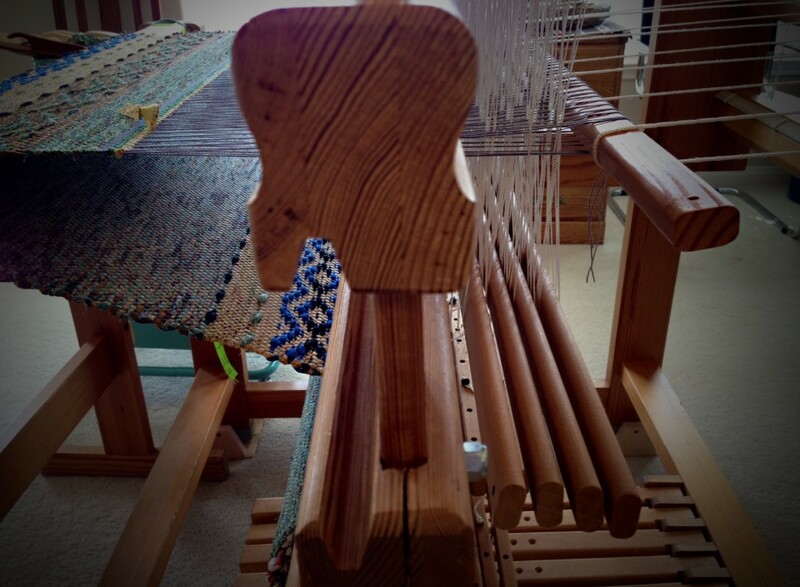 For someone who starts out on a jack loom, these advantages may be more difficult to adjust to. Can you teach yourself? Yes, it’s possible to teach yourself. You will go further sooner, though, if you get some hands on coaching in the very beginning. Habits form that will make a difference in your efficiency and quality. Without good instruction, you won’t know what bad habits you are forming. And you won’t know what you don’t know that could simplify your efforts and increase enjoyment of weaving. Frustrations can end a dream. If you have more questions, feel free to contact me directly through “Get in Touch” at the top of the page. Have a wonderful time exploring the possibilities! The goal is to weave a firm selvedge on a rag rug. This is especially challenging when the weave changes, like it does with this rug. Plain weave in a single color, a lone weft in a contrasting color, rosepath with tabby in between, and plain weave with alternating colors. It helps to have a few guiding principles. 1. Make sure the weft going into the shed catches the outermost warp end. If needed, manipulate the outermost warp end up or down to make this happen. 2. When using two shuttles, start the second shuttle going in the same direction as the first shuttle. 3. When using two shuttles, be sure to catch the “idle” weft at the selvedge by crossing over or under it with the “working” weft. 4. Turn the fabric strip under twice at the selvedge. Coming to the end of the last rag rug on this warp. Weaving plain weave with two alternating wefts gives the tidiest selvedge because of the way the wefts interlock as they cross at the edge. I can handle any rag rug selvedge if I pay attention to these guidelines. Similarly, are there guiding principles that help us maneuver the daily challenges of life? Following God’s ways gives needed structure to our days on this earth. His faithful guidance is that of a loving father. By practicing his principles we can be mentally prepared for action, emotionally stable, and spiritually focused. And we find we are well able to handle all of life’s twists and turns. May you meet your challenges with success. That’s the beauty of rosepath. The floats in the rosepath motif (the blue) against the tight plain weave (the light colored background) give the blue a raised appearance. The dark-light contrast also contributes to making the blue appear to stand out even more. The blue fabric strips are cut the same width as the other strips – 3/4″. For rosepath rugs I use 4 shafts and 6 treadles (4 treadles for rosepath, and 2 treadles for plain weave). I am new to weaving and am thrilled to find your blog with all your information and pictures of the beautiful things you make! I also love this look! Can you tell me what kind cloth you used for your weft on this rug and do you cut the strips yourself or can you buy rolls? Also how wide should the strips be if to be used for the weft of a table runner? Thank you! Hi Wendy, It makes me so happy that you enjoy these pages! I use cotton fabric for the weft, cut in 3/4″ strips, with a sett of 8 epi. I have a short video that demonstrates how I cut the fabric at the end of this post: Quiet Friday: Weave a Bag with Handles. 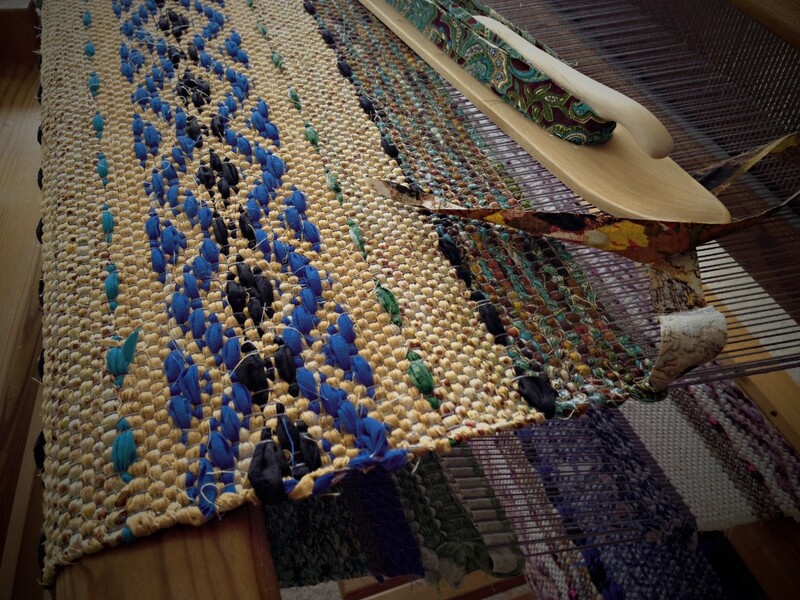 The weaving width is probably the main factor for making a table runner. You could use 3/4″ strips or narrower, depending on the look you want. I have used 1/4″ strips for table runners, with a sett of 20 epi. Each rug is unique. Knowing what the possibilities are with a rosepath threading, I sketch a plan on graph paper. I pull colors from my stash of fabrics, adding, mixing, and removing, until the compilation is just right. My intention is to create a rag rug that will be noticed. Plain weave sections in solid colors separate bands of rosepath patterning. I start with a confident plan, but I will not see the results until the rug finally comes off the loom and is flat on the floor. I am hopeful, but there is still uncertainty. Do you ever feel that way about talking to God? It should be easy to pray, but how can we know if we are really getting through? The Lord hears prayers. His willingness to hear is greater than my ability to express myself. When I take the fabric scraps of my life and arrange them in a pattern that pleases him, he notices. And he hears my inadequate sentences. 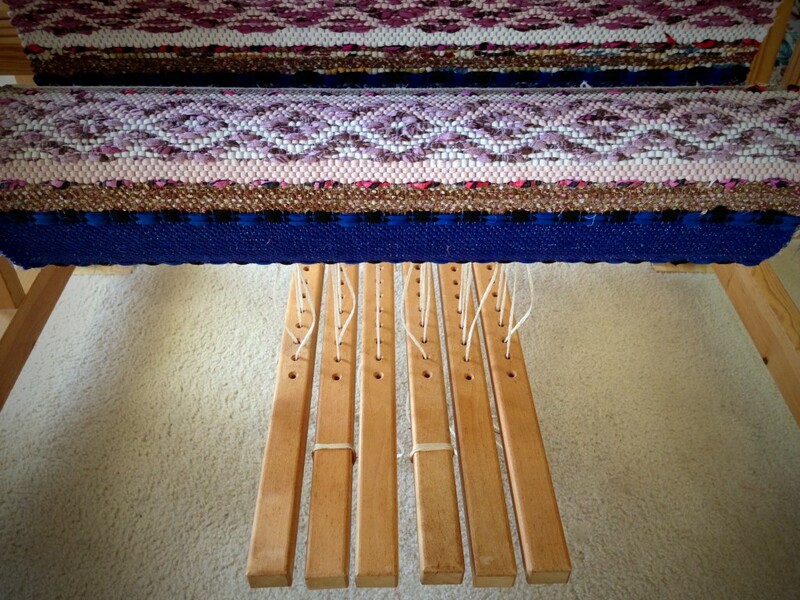 As each woven rug rolls onto the cloth beam, what I do see gives me hope for the end results. Though my view is incomplete, every glimpse of answered prayer gives assurance that the Lord notices this weaving I call life. May you get a glimpse of what you hope to see. At the risk of telling you something you already know, I am going to show two ways I use rubber bands in my weaving studio. Yes, rubber bands. Simple, to the point of being simplistic. But I sheepishly admit, I didn’t know to do these things until I saw someone else do them; and then I expanded (pun intended) their practices to suit the way I like to work. Plain weave, like the solid blue section, and the band of brown, uses the two treadles on the right on this Glimakra Ideal loom. 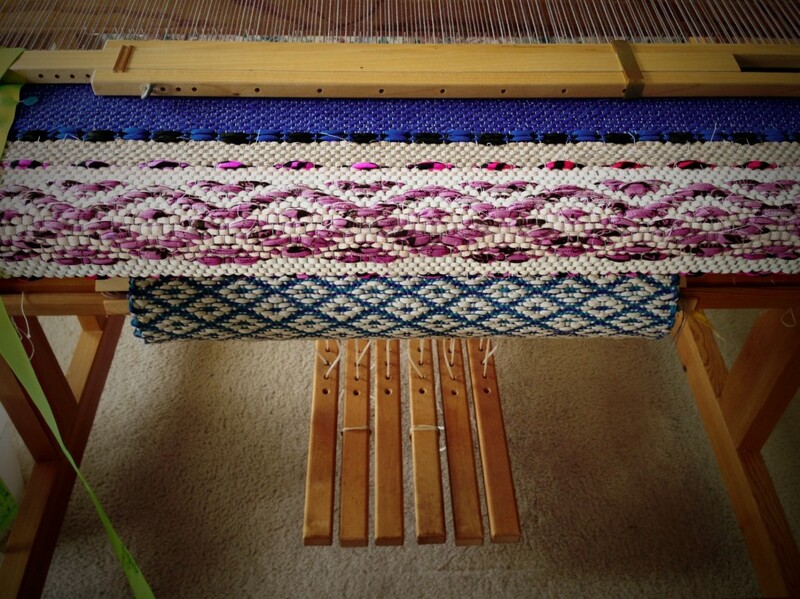 The rosepath pattern, in orchid, and the dots and dashes, in dark pink and blue/black, uses the remaining four treadles. Five treadles are used for this rya weaving on the Glimakra Standard loom. 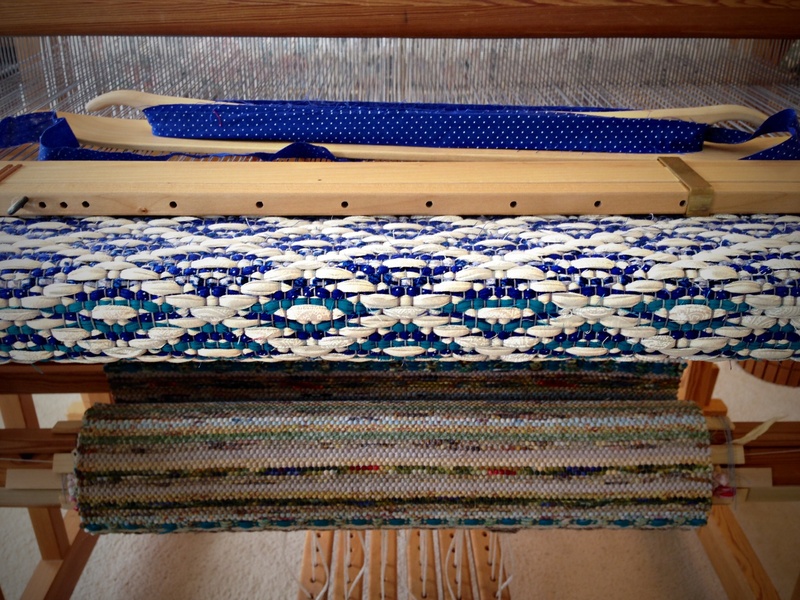 The treadle on the right lifts the warp ends on the second shaft, onto which the rya strands are tied. The remaining four treadles are used to weave a rosepath pattern in the cloth. 2. Rubber band the thread label around the tube of thread. This is the simplest way to keep track of fiber information–fiber content, weight, color number, brand. I also cut a short length of the thread and stick it to the sticky side of the label. This helps me get the labels back on the correct tubes, especially when using several threads of different colors. With similar colors, like these two tubes of 12/6 cotton rug warp, it helps to keep an identifying strand attached to the label. I always try to put the label back on its tube as soon as possible to prevent mix-ups. May you find simple solutions to do what you do better. Many variables are possible on this rosepath threading, but I find creative freedom by imposing certain limitations for the design of the rag rugs. The overall design concept gives me direction for arranging colors and setting a treadling pattern for each rug. Overall rosepath is featured on this rag rug, appearing as a diagonal white grid on the top side, with subtle color changes in the background weft. Previous rug is seen wrapping around the cloth beam below. How many times have I gone off track, only to realize that I didn’t really get on a track in the first place? When I start without clear intentions, I set myself up for inconsistent results (HERE is one example). This is true for weaving rugs and for dealing with people. If I determine to live by a standard of kindness, those clear intentions will shape how I speak and act. We can protect relationships with kindness, which is at the heart of love. The greatest enemies to love are biting words, a sharp wit at someone else’s expense, and shading of the truth. Who wants to be on the receiving end of that? Self-imposed limitations on our words open up creative expressions of kindness. The beauty that is formed by these sincere expressions is a beauty that stands out, being different from the norm; and it’s a beauty that endures. May you experience someone else’s kindness today. Come check out my new Etsy! Just click on the Etsy Shop page above. Let me know what you think. I grew up watching my grandfather weave rugs, Summers I would help him with craft fairs and also learn a little of what he did. My grandfather died at the age of 91 still weaving rugs and was blind, he learned to weave rugs at a camp for the blind early in his years. He has been gone for 20 years and he has left to me one of his looms. I look at it all the time and know he would want me to enjoy it as much as he has. He is known in Lacrosse, WI as the blind rug weaver. His name was Oscar Erickson and I’m his grand daughter Brenda Adams, I live in a little town in Illinois named Hampshire. I would love to set his loom up and show my children what their great grandfather did to support his family and did because he loved it so much. I would love the chance to talk with you and share more information if you had time. I look forward to talking with you.